Just follow the below steps to check your result for Razi Fellowship 2018. 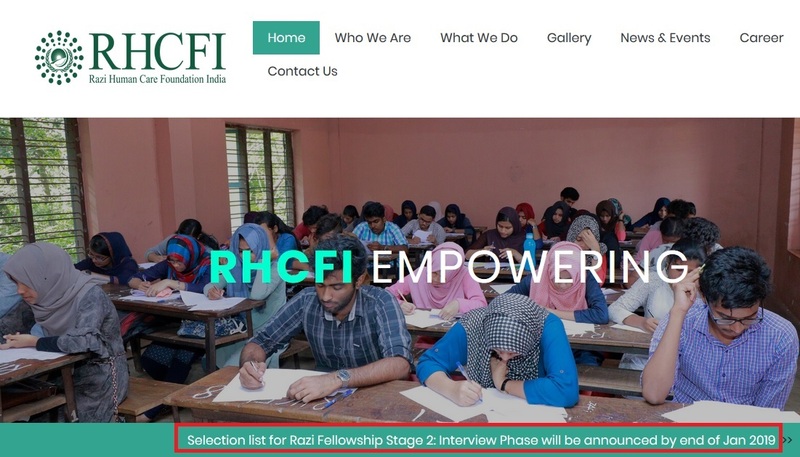 Step 2 : Next click on the “Selection List For Razi Fellowship Stage 2” link in the home page. Step 3 : You can search your result by name and Roll Number. The Fellowship is conducted every year at two screening levels. 1. All the registered candidates will be shortlisted for Stage-1 written test after verification and scrutiny of the application. 3. Those who are qualified and shortlisted students will be called for Stage – II i.e. Personal Interview. 4. Fellowships will be awarded by considering the overall performance of the student in the two Selection stages. Qualified and shortlisted students in the written aptitude test will be called for Interview. The Career plans, personality, character, conduct, stress management, emotional intelligence, ethical and moral views, and social commitment of the student will be evaluated. iii) National & International Level Workshops, Exploratory visits to Research Laboratories and Institutions of Excellence to top 200 short listed students. iv) Regional Level Camps, workshops and Seminars to top 2000 short listed students. I am not able to find out the result. Please assist me to get the result. Please tell me the interview date. Please, can I know my result (or) my rank? Kindly assure the result as fast as possible. I want to know, when will you publish the result. Please, can you show me the exam results. I CANT GET MY RESULT. ASSIST ME PLEASE. I can’t get the results of this scholarship.